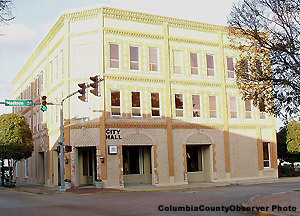 LAKE CITY, FL – Last night in City Hall, Councilman Jake Hill followed up his July 17, 2017 question to City Manager Wendell Johnson, "Wendell, could you tell me what it's goin' to cost the City to move out of this building to across the street? Out of this buildin' into the Blanche Hotel?" Since being reelected to the Council in November 2016, Hill has complained he is being "kept in the dark" about the details of the Blanche. He is not the only one. Links to Blanche stories are here. On July 17, 2017, as the City Council meeting drew to a close, Councilman Hill asked City Manager Johnson, "Wendell, could you tell me what it's goin' to cost the city to move out of this building to across the street? Out of this buildin' into the Blanche Hotel." City Manager Johnson answered, "I'm not sure I understand your question Mr. Hill." Councilman Hill repeated his question, "What is it going to cost us to move out of here -- out of this building across the street?" City Manager Johnson responded, "I don't know. I don't know yet what it's gonna cost. Are you're talkin' about the physical movin' part or are you talking about the contractors?" Councilman Hill answered, "Physical move." Mr. Johnson responded, "I got no way of knowin' that, but I'm assumin' that most of the work to move over there by the city work force, so I don't see that the cost is goin' to be phenomenal... At this point I couldn't give you an accurate, reliable number of exactly what dollar amount it's goin' to cost us." Mr. Hill concluded saying he would come by and talk with the City Manager, who said he would welcome that. Once again, as the meeting drew to a close, Councilman Hill asked again, "Could you give me some figures for what it is going to cost to move into the Blanche? I think that we need to do a workshop -- a couple of workshops -- to move into the Blanche Hotel. Could you do that for me please?" 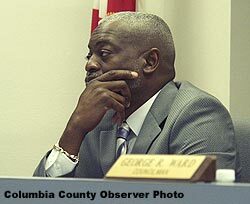 Mr. Johnson replied, "Mr. Hill, respectfully that's not a Wendell Johnson decision to do a workshop. That's your council here. If they want to that, it will take the council to do that. I'm ok with it." Councilman Hill: "I make a motion that we do a couple of workshops about the Blanche Hotel -- the figures -- ball park figures for what it's going to cost to move across the street." The vote was 4-1 in favor of the workshop. A barely audible George Ward voted against the motion. Mr. Johnson asked, "Do you want to leave that to my discretion, to set that up?" Without waiting for an answer, he continued, "Let me share something with the Council. The Development Agreement, which includes the Lease Agreement and the Tenant Build Out Plan – is coming close to the final stage. They're still doin' some tweakin' between the attorneys. The closing was originally scheduled for the end of this month. It's been postponed until September 15." "My original plan was to bring the agreements back to the City Council on August 21st. That has been bumped, at this point, to September 5th." Mr. Johnson continued, "I'm goin' to have a personal meeting next Monday with the representatives of the Blanche to get myself assured of what these things Mr. Hill you are talkin' about that cost -- everything -- includin' movin' -- the logistics portion of it -- that's somethin' that's separate from the agreements... If you're going to have a workshop that needs to be done before that agreement comes to the Council." The Council agreed to have a Blanche workshop on September 5 at 5 pm. 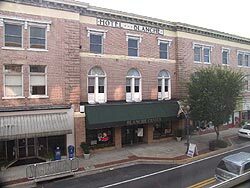 It is estimated that the yearly rent and overhead, once the City moves out of City Hall and into the Blanche will be approximately $400,000 a year. If and when the agreement is approved by the City Council, the City will have to turn over to the developer a grant of $1,000,000 cash, nonrefundable dollars. Out of room in City Hall? Lake City, City Hall: The Observer has been unable to find anyone who can demonstrate that the present 3 story 15,000 sqft City Hall is "inadequate." The April 14, 2016 version of the Development Agreement states that the present office space in City Hall: "is inadequate for the efficient and effective operation of the duties and responsibilities of the City. Inasmuch as the building which presently houses City Hall cannot be structurally enlarged to provide additional office space which is needed by the City, the City has an opportunity to acquire office space from the Owner of the Project for a new City Hall in a portion of the redeveloped Project consisting of approximately 38,550 square feet under the terms and conditions of a fifteen (15) year lease (herein “City Lease”), which grants an option for the City to purchase the leased premises..."
The Development agreement calls for the City to waive, "To the fullest extent allowable by present law, all permit, impact and other fees charged by the City during the plan review and construction phases of the Project." In the Agreement, the City estimated those fees to be valued at $58,844. The Agreement also calls for the City, "To the fullest extent allowable by present law, abate or cause to be abated all ad valorem taxes generated by the Project during the financing, construction and operations phases of the Project for a period of ten (10) years." According to the Agreement, the City must enter into a 15 year lease with the owner, who also appears to be the developer. After seven years and payment of the $1,000,000 grant and approximately $3,000,000 plus in rent and overhead, the City will get the chance to buy the building back at its appraised value at that time (after 7 years). The City is not entitled to any discount for the $1,000,000 grant, nor any credit for the payment of rent, nor any credit for the waiving of all fees, nor any credit for the 10 years of tax abatements by the City. Also not taken into account is the approximately $6,000,000 in tax credits, which is really like a $6mil cash gift to the developer. This $6mil kicks in at approximately the 7th year. After working for over two years under the cover of darkness (see: Wendell Johnson's IDP Blanche Legacy Project: Top Secret Before it Should Have Been), the September 5 workshop may be the people's chance to finally know what Mr. Johnson and the Developer have been up to.